FAQ: What does it mean to be a board-certified plastic surgeon? A plastic surgeon undergoes extensive education and training, culminating in board certification by the American Board of Plastic Surgery (ABPS). This board is part of the American Board of Medical Specialties (ABMS), the ONLY organization that collaborates with and certifies the 24 specialty member boards, of which ABPS is a member. The ABPS is the only board recognized to certify surgeons in plastic surgery of the entire body—the face, breasts, body, and extremities. FAQ: Is a cosmetic surgeon the same as a plastic surgeon? Absolutely not. The title “cosmetic surgeon” and “plastic surgeon” are not interchangeable. Any physician of ANY specialty who makes surgical changes to a patient’s appearance can be considered a cosmetic surgeon. A plastic surgeon is a physician who has completed a residency to gain education and training specifically in plastic surgery, both aesthetic and reconstructive. Plastic surgeons may choose to call themselves cosmetic surgeons, but the reverse is not true; cosmetic surgeons should not call themselves plastic surgeons. There is no board certification in cosmetic surgery certified by the ABMS. FAQ: What’s important to look for when choosing a plastic surgeon? Look for a surgeon who is certified by the American Board of Plastic Surgery (ABPS). To earn this distinction, a plastic surgeon must have a college degree and a degree from an accredited medical school, a minimum of five years in a surgical residency, two years or more in a plastic and reconstructive residency, followed by successfully passed both written and extensive oral exams over a year-long time period once in practice. A board-certified plastic surgeon then continues to maintain board certification with continued medical education programs. Adam C. Augenstein, MD strives to maintain the high standards set forth by his specialty and values the trust his plastic surgery patients in Charlotte, NC. place in him. FAQ: What is the cost of a consultation? Dr. Augenstein believes strongly in patient education and can spend up to an hour with his patients during the initial consultation. This provides a great opportunity to come in and review your aesthetic goals personally with him and determine a procedural plan that meets these goals. Dr. Augenstein believes that patient education is one of the most important ways to ensure a successful surgical outcome. Aesthetic Surgery of Charlotte requests a $50 consultation fee, which can be credited towards any future surgery and/or service with Dr. Augenstein. FAQ: Do you accept insurance? Aesthetic Surgery of Charlotte accepts most insurance plans and Medicare. Please call to find out if yours is accepted, or call your insurance carrier. FAQ: Is any cosmetic surgery covered by insurance providers? No, cosmetic surgery is not covered by insurance providers. However, reconstructive surgery, such as facial reconstruction after MOHS surgery and facial trauma is generally covered. Please call your insurance company for further details. FAQ: Does Aesthetic Surgery of Charlotte offer financing options for cosmetic surgery and med spa services? Yes, we have partnered with several companies who specialize in financing these services—ALPHAEON CREDIT, Prosper Healthcare Lending, and CareCredit®. They offer several financing options so you can spread out the cost of your med spa or cosmetic surgery procedure in Charlotte with manageable monthly payments with very competitive rates. Dr. Augenstein’s team will help you find the option that best fits your budget and needs. FAQ: Where is Aesthetic Surgery of Charlotte located? We are located on the second floor of the Horizon Eyecare Building in the new Waverly development in South Charlotte. 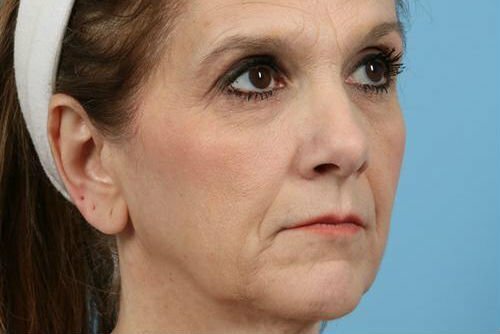 FAQ: How do I know if I need a necklift with my facelift or a facelift alone? Facial rejuvenation procedures and recommendations by Dr. Augenstein are based on your unique features. 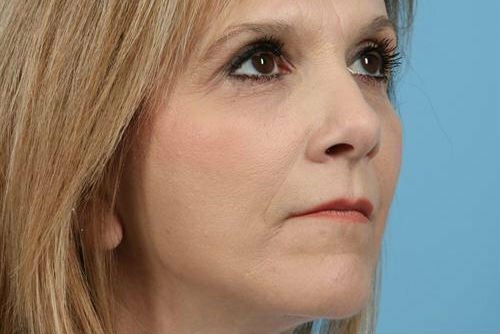 Patients with bands that are visible in the neck and/or have lost the youthful jaw angles and/or have excess skin of the neck benefit from the addition of a neck lift to their facelift. Little downtime is added, but the changes that it can produce are dramatic compared to a facelift alone. A facelift alone is typically done for patients with some jowling and who do not need their neck addressed. FAQ: Does Aesthetic Surgery of Charlotte offer non-surgical options for facial rejuvenation? At Aesthetic Surgery of Charlotte, we offer a comprehensive line of medical-grade skincare specially formulated and designed for our medspa. Backed by extensive research and testing, we are committed to provide nontoxic products with individualized treatment plans. Similarly, we offer chemical peels, laser skin treatments, and injectables for improving fine lines and wrinkles, as well as adding youthful and natural volume to the face and lips. FAQ: After breast augmentation, what is my recovery like? Most patients have some swelling for four to six weeks and are sore for one to two weeks and may take a few days off from work. Over the next six weeks, you will wear a comfortable bra and have a gradual increase in physical activity. FAQ: Does Dr. Augenstein perform reconstruction after Mohs surgery? After removal of skin cancer by Mohs or other surgery, Dr. Augenstein coordinates repair with your dermatologist so that you can get back to your daily routine as soon as possible; at Aesthetic Surgery of Charlotte, we take an aesthetic eye into the process of reconstruction. FAQ: I haven’t been able to eliminate my baby weight since my pregnancy. What can I do to restore my flat tummy? After pregnancy, not only can there be loose or stretched out skin, but the abdominal muscles can also be lax. As part of a tummy tuck procedure, not only is the loose skin removed, but the abdominal muscles are tightened. This results in the restoration of a flat and tight tummy. FAQ: What is my recovery after a tummy tuck? Most patients will need to plan on about two to three weeks of recovery with resumption of full activity after six to eight weeks. FAQ: I lost a significant amount of weight after bariatric surgery, and now I have a lot of excess skin. What can I do to get rid of it? There are procedures that can address all areas where the excess skin persists. A facelift and/or neck lift to correct jowling or hanging skin of the neck, a thigh lift to address the thighs, a brachioplasty or arm lift to eliminate excess skin of the arms, a body lift or tummy tuck to address the trunk or mid-section, a breast lift or mastopexy with or without implants to rejuvenate and lift the breasts, or an upper back lift to tighten and eliminate skin folds of the upper back in the bra line area. FAQ: When is the best time for me to undergo body contouring after massive weight loss? Whether due to bariatric surgery or diet and exercise, a lot of changes occur to someone after losing a large amount of weight. In addition to nutritional assessments that are performed before surgery to optimize healing, we recommend waiting until the weight loss has been stable for three months and you are near your goal weight.